At the tail end of installing 15 solar plus storage microgrids across Puerto Rico — all of the work charitable — Sonnen and Pura Energia are providing humanitarian relief and a hint of the energy model the island could become. 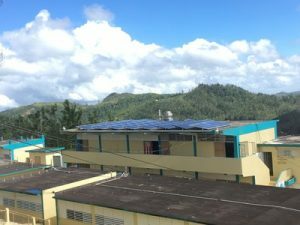 The latest installation, for a school in the mountain town of Orocovis, comes as over 14 percent of Puerto Ricans remain without power following last Fall’s Hurricane Maria. Located in a remote, mountain community in southern Puerto Rico, S.U. Matrullas provides K-9 education for some 150 students. Utility grid service was poor and unreliable even before Hurricane Maria struck. The hurricane damaged the school building and homes and wiped out the local grid, as well as water, services infrastructure. US subsidiary of Germany’s Sonnen and solar company Pura Energia stepped in to fill the void, drawing on equipment and materials donated by the two companies, as well as by other public and private-sector sources. S.U. Matrullas has reopened its doors to students and the community, and now relies entirely on the solar plus storage microgrid, which also includes a backup diesel generator. The team also has installed solar plus storage microgrids in the communities of La Perla, Loiza, and Morovis. These microgrids are used to power washing machines, refrigerators and some basic electrical outlets. Each microgrid is supporting hundreds of homes whose water was contaminated by the deadly Leptospirosis bacteria. Microgrid Knowledge spoke with Jose Garcia, Pura Energia’s president and Adam Gentner, Sonnen USA’s director of business development, Latin American Expansion, regarding their charitable microgrid projects in Puerto Rico. They offered insight into what the future may hold in terms of energy infrastructure and services across the US island territory. Even with the assistance of federal agencies, the island’s electric monopoly, the Puerto Rico Electric Power Authority, continues to struggle to restore public power in the wake of Maria. Sonnen entered the chaotic scene by establishing the Foundation for Energy Security, which, along with Pura Energia, will donate 15 microgrid systems — which they call Energy Oasis — to Puerto Rican communities. In Orocovis, residents didn’t expect utility grid power to be restored for months. But thanks to their new Energy Oasis, now school administrators don’t intend to reconnect to the utility grid even when service is restored, according to the partners. 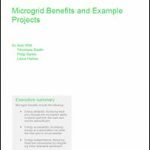 “The microgrid is donated, but had they had to cover the total cost of project it would probably take 2.5 to three years, and the electricity service they now have is much more reliable. It operates 24×7,” said Garcia in an interview. In addition to Orocovis, Sonnen committed to donating the 14 other microgrids, each of which consist of Pura Energia photovoltaic (PV) systems and Sonnen lithium-ion batteries. The microgrids will also typically include diesel generator backup. The microgrids on average have a total energy storage capacity of 94 kWh and a PV capacity of 48 kW. The project partners are concentrating on three more microgrids at the moment, Garcia said. The terms and conditions of two are yet to be completed, but Pura Energia expects them to be signed soon. The third microgrid project is under way in the town of Lares. “It’s a small, agricultural town with several coffee plantations high up in the mountains,” he explained. When Maria destroyed the electric grid, some coffee plantation workers and their families lost their jobs and the housing provided by plantation owners. “The Lares project is unique in that it aims to provide a permanently powered housing option to local farmers whose homes were destroyed by the hurricane, but who did not own the land their homes were on,” said Sonnen’s Gentner. Pura Energia and Sonnen are in the process of designing the Lares microgrid. “It’s not definite, but there will be two, 16 kWh Sonnen [battery storage systems] and we will install about 10 kW of solar PV capacity,” Garcia said. In addition to being famous for the quality of its coffee beans, Lares holds an important place in Puerto Rico’s struggle for independence from Spain in the 19th century. Lares has experienced a population exodus since 2010, according to the U.S. Census Bureau. By providing reliable local energy, Pura Energia and Sonnen might help Lares to stem the exodus. “It is our belief that communities in disaster-prone areas should have community and residential energy storage and production capabilities to provide residents with access to energy – which provides access to communication, food and medicine storage, laundry and cleaning capabilities, and security – to help survive power outages after the disaster and to help speed the recovery efforts,” Gentner said. Gentner also pointed out that with support from the utility, solar plus storage microgrids can enhance utility grid operations and resiliency. “I believe that a properly designed system can provide both backup and grid-tied capabilities,” he said. As an example, Genter described Sonnen’s project in Jasper, Arizona, where a distributed network of energy storage systems manages solar energy to offset a duck curve — a mismatch that occurs between the time solar panels produce electricity and the time consumers demand the power. “The Sonnen systems being installed in Puerto Rico, with the express goal of backup power, have this capability as well, he said. Genter described a Sonnen virtual power plant community in Germany as an example of how the systems can improve grid stability through load shifting, frequency regulation, and voltage regulation. Battery and PV owners share self-produced energy with other members, obviating the need for a conventional energy provider. 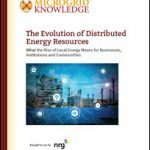 Track news about solar plus storage microgrids by subscribing to the free Microgrid Knowledge newsletter.